Put-in-Bay Discounts | Specials on Hotels, Resorts, Golf Carts & More. Put-in-Bay Discounts on Hotels, Resorts, Villas and Lodging Accommodations. Last year over 2800 families enjoyed a great package stay at the Put-in-Bay Resort and the Bay Lodging Resort in conjunction with the Jet-Express ferryboat. Your package at your choice of these Put-in-Bay Hotels includes a room that sleeps up to four people or a suite that sleeps 6 people, a complimentary overnight golf cart rental for each day of your stay, complimentary continental breakfast, and coupons worth over $100.00 in discounts at Put-in-Bay restaurants and attractions. Rooms that sleep 4 people are $179.00 and include a 4 person golf cart. A $250.00 package value. Suites that sleep 6 people are $209 and include a 6 person golf cart. A $300.00 package value. Terms and conditions: Offer valid for Sunday thru Thursday stays, April 8th thru October 24th, 2019 (offer excludes May 27 and July 4th, August 29th and September 2nd). Offer must be booked by phone by calling 1-888-742-7829 and must mention the Jet Away Getaway when booking. Standard deposit and cancellation policies apply. Valid with new reservations only. Discount Coupons are distributed with your paid fare aboard the Jet Express Ferry. Quantities are limited, early reservations are suggested. With the end or start of school coming up, here is a Put-in-Bay Discount special for a last minute weekday getaway to Put-in-Bay!! Book a room (normally $125 per night) and get upgraded to a suite (normally $175 per night) and we also include a free golf cart rental (normally $50 per day) for the duration of your stay. A 2-room suite is perfect for families, sleeps up to 6 people and has 2 queen beds in the bedroom, a queen sleeper in the living room and a kitchen with a full-size refrigerator, freezer, microwave, and wet bar. Put-in-Bay Discounts on The Put-in-Bay Jet Away Getaway Package. Last year over 2800 families enjoyed a Put-in-Bay Discount package at the Put-in-Bay Resort in conjunction with the Jet-Express ferryboat. Your package includes a room that sleeps up to four people or a suite that sleeps 6 people, a complimentary overnight golf cart rental for each day of your stay, complimentary continental breakfast, and coupons worth over $100.00 in discounts at area restaurants and attractions. Rooms that sleep 4 people are $179.00 and include a 4 person golf cart. A $250.00 package value. Suites that sleep 6 people are $309 and include a 6 person golf cart. A $300.00 package value. Terms and conditions: Offer valid for Sunday thru Thursday stay, April 8th thru October 24th, 2018 (offer excludes May 27 and July 4th, August 29th and September 2nd). Offer must be booked by phone by calling 1-888-742-7829 and must mention the Jet Away Getaway when booking. Standard deposit and cancellation policies apply. Valid with new reservations only. Discount Coupons are distributed with your paid fare aboard the Jet Express Ferry. Quantities are limited, early reservations are suggested. Save $5.00 off a daily Put-in-Bay golf cart rental when you book on line and advance reserve your golf cart. 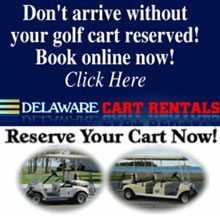 Delaware golf cart is the largest golf cart rental on the island with over 300 golf carts with seating configurations for 2-4-6 & 8 people. Delaware Carts rents hourly, daily, overnight and weekly. Be sure to reserve your Put-in-Bay Golf Cart online! From April 8th up to and including June 20th 2019 (offer excludes May 27th), book an 8 person family villa normally priced at $325.00 for only $275.00 (or a 12 person 5 bedroom villa for $325) and receive a free overnight rental on a 6 passenger golf cart (an $80.00 savings) and breakfast for your entire group. A total savings of over $155.00!! The 8 person villa features 4 bedrooms, 3 bathrooms, a living room with 55-inch plasma TV, a fully equipped kitchen and your own private deck and balcony facing the heated pool with swim up bar and the world’s largest Jacuzzi! Terms and conditions: Offer valid for Sunday thru Thursday stay between the above dates. Offer must be booked by phone and must mention the Put-in-Bay Villas Back to School Special when booking. Standard deposit and cancellation policies apply. Valid with new reservations only. Quantities are limited, early reservations are suggested. Package must be booked by calling 1-888-742-7829.